Let’s hope another quarter-century doesn’t have to pass before we see LADY IN THE DARK. Do the math: nearly twenty-five years to the day will have passed since Encores! resurrected the groundbreaking – nay, earth-shattering – show in its first-ever season. 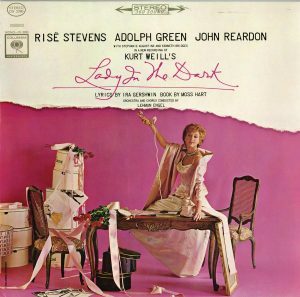 But if the next airing of LADY IN THE DARK does take an inordinate length of time, there is a 1963 studio cast album to fill the gap. The 1941 musical makes a welcome return to City Center on April 25-27, thanks to MasterVoices. Its artistic director Ted Sperling will direct and Doug Varone will choreograph. In addition to such stars as Victoria Clark and Amy Irving (in the role of a psychiatrist originally played by a man), you’ll see a chorus of 120 – and, no, that’s not a typo. Risë Stevens – who was usually found at the Metropolitan Opera – played the part that Gertrude Lawrence had originated: Liza Elliott, the editor-in-chief of a popular fashion magazine. Despite her success, Liza is haunted enough by past memories, man troubles and current experiences to seek that psychiatrist. Moss Hart did that in the 30s, which led to his writing about his analysis. He spent much of 1938 working on a musical with George S. Kaufman about a woman who takes to the couch. She’d be played by Marlene Dietrich who’d sing a Rodgers and Hart score. But that Rodgers and Hart AND Hart and Kaufman musical would never happen. So Hart reconceived the project as a straight play called I AM LISTENING for Katharine Cornell – until he met Kurt Weill at a party and the two discussed how the musical theater needed to grow. The recent PAL JOEY had given them courage to look beyond what musicals had been. Both of them knew that a serious musical about a then- unlikely musical theater subject required a top-flight lyricist. Could Ira Gershwin be enticed out of retirement? He’d been in a terrible but understandable depression since his brother and collaborator George had unexpectedly died three years earlier. He could. So the project that had started out as a musical and then became a play ironically enough morphed into a hybrid of both. LADY IN THE DARK would start not with an opening number, but with a music-free book scene. After it would come not just a mere song, but an extended musical sequence. Following that would come another straight-on book scene that would lead into a – well, can’t you guess? Maverick entertainments don’t usually score well with the public – at least not the first time around – but theatergoers rose to the occasion and the challenge. They kept LADY IN THE DARK in the limelight for a most successful 467 performances. No true recording of the original production was made because LADY IN THE DARK opened twenty-six months before OKLAHOMA! started the ball (and turntable) rolling with the recording revolution known as the original cast album. During the ‘50s, musical director Lehman Engel started going into the studio and recording shows that had predated the original cast album era. A decade had to pass before he braved LADY IN THE DARK, but he eventually got to it. This was very valuable, for what made LADY IN THE DARK unique were its Dream Sequences (again – twenty-six months before OKLAHOMA!). Liza told her psychiatrist her surreal “Glamour,” “Wedding” and “Circus” dreams; musical theater enthusiasts had long wanted to hear them and starting in October 1963, they did. Until that recording, however, those who wanted to hear LADY IN THE DARK had only two different sets of six (albeit terrific) songs. A month to the day after the Jan. 23, 1941 opening, Lawrence went into the Victor studio (as RCA Victor was known then) and recorded some of her material. A few days later, Danny Kaye, who played magazine’s photographer, went into the Columbia Studios and recorded his half-dozen. Kaye’s cuts are included as bonus tracks on this 1963 studio cast album. Of course Kaye did “Tschaikowsky” which had just jumpstarted his career. But he also did “It’s Never Too Late to Mendelssohn” which might have done the same had he been allowed to do it. Kaye also recorded “The Saga of Jenny,” “My Ship,” “The Princess of Pure Delight” and “One Life to Live,” although they were all Lawrence’s numbers and among the six that she’d recorded. We might not have had “The Princess of Pure Delight” which asked the musical question “What word of five letters is never spelled right?” if it hadn’t been for Richard Rodgers. Although he never did write music to Moss Hart’s creation as originally planned, he spurred the song into existence. It happened when the three collaborators were working at Hart’s place in Bucks County and Rodgers paid a visit. As the night wore on, one of them took out a quiz book that included this riddle (which I bet you’ve already guessed by now). That Lawrence waxed “One Life to Live” is surprising. Throughout the run, she would request (and later beg) Weill and Gershwin to replace it. They never did, and a listen to the jaunty tune shows that legendary stars don’t have all the answers. Or maybe they do. On opening night in Boston, after Kaye had received a solid minute’s worth of applause after “Tschaikowsky,” the writers went into a panic. Could Lawrence possibly top it with “The Saga of Jenny,” their song about the seven ages of woman? Indeed she could, and received TWO minutes of applause. Hart, Weill and Gershwin all expressed delighted surprise if not shock because for the first time, Lawrence, showing extraordinary improvisational skills, did it with burlesque-worthy bumps and grinds. But again, if you can’t make it, Risë Stevens and Adolph Green in Kaye’s role will always be available to you.